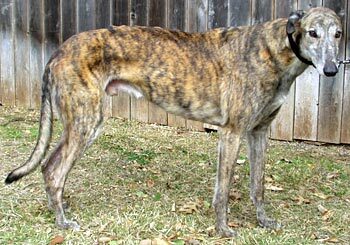 Czar is an 8-year-old brindle male born in March 2001. His racing career followed in the steps of his lineage, racking up almost 75 races under his belt, all in the state of Arkansas from 2002 to 2004. He then went on to help other dogs by being a blood donor. When Czar arrived at GALT he was limping off and on; an evaluation determined that not only did he have corns, but he also had a toe that needed to be amputated. Both have been addressed, as well as removing several teeth, and Mr. Czar is now ready to find him forever home! It is not known at this time if Czar is small animal or cat tolerant. Czar is mild-mannered boy who has learned to enjoy owning a house after doing duty as a blood donor when his racing career ended. He now seeks out attention and is especially attuned to the dog biscuit canister lid being lifted. He loves to crunch despite having lost a few teeth. Czar would do best in a quiet home with adults or older children. He takes a little while to warm up to people, and if the situation is too demanding he will walk away and find a quiet place to lie down. He has not been cat or small-dog tested, but he is very interested in the free-roaming office kitties at the veterinary office. When a little wild critter runs across our yard, he is right there to join in the chase, the only time he really runs at all. He gets along fine with the three Greyhound brothers and Rottweiler sister with whom he’s being fostered. While he is happy to lie down on the same dog bed with one of them, he is only occasionally inclined to run and play with them, and when they get boisterous he heads into the house to hang out. Even when they are trying their best to get him to play (and they can be quite annoying), he has not snapped or shown aggression at all. He came to GALT with some leg and back issues, and has had one toe on his hind leg amputated because it was severely dislocated. He now feels much better and enjoys a short romp in the yard when the weather is cool. As is with many older greyhounds, Czar has been diagnosed with a lumbar sacral issue. Periodic treatment with an anti-inflammatory at this time helps him. Because of his medical history, his veterinarian has said he will do best with quiet walks rather than runs, and a soft, comfy dog bed to lie on (although he does enjoy cool tile as well and can sometimes be found stretched out in the shower). Because of his back, crating him would be hard on him because he really needs to stretch out, but he would do fine in an x-pen with a comfy bed. He is dog-door trained, never tries to get on furniture and never chews or bothers anything in the house. Czar is a sweet, gentle boy who is ready for a nice, quiet forever home. Perhaps he is just the grey YOU have been waiting for!